Vlatka Horvat, Fixed Holes, 2017, cardboard, felt, adhesive tape, 1 1/4 x 59 x 57". For her first exhibition in Italy, Croatian artist Vlatka Horvat has installed eleven works across the gallery’s two floors. “Surroundings” pays homage to the horizon, as both a spatial boundary and a goal to which one can aspire, ideologically and physically. The show’s natural path opens with two wooden tables created in 2016, titled Set Right (Table Leg) and Set Right (Tabletop). Reduced to structural skeletons, they boast delicate additions of ribbonlike cardboard, attached with white adhesive tape, as if to conjure missing parts. At Some Length, 2017, is a straight line at eye level, more than twenty-five feet long, composed of knotted rubber bands and cotton threads. Despite its materials’ fragility, the piece evokes the severity of barbed wire. 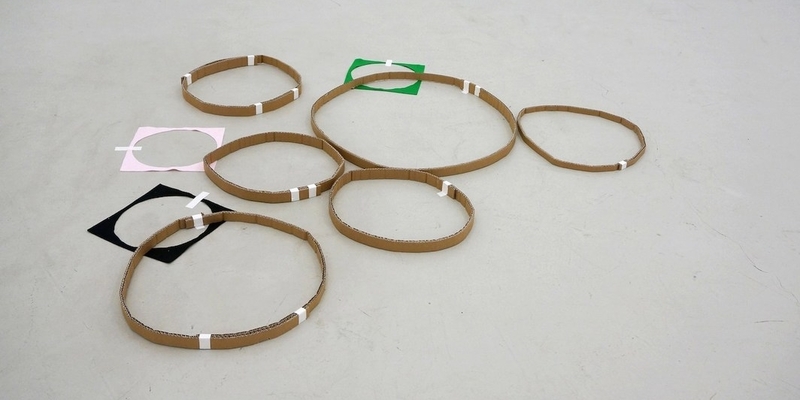 Fixed Holes, 2017, meanwhile, comprises six rings of cardboard overlapping three squares of colored felt with circular punch-outs, the negative space echoing the cardboard loops’ round forms. The ambiguous composition suggests a rudimentary demarcation of territory while also conjuring some sort of lagoon. Landscapes become concrete in the five photographs in the series “Tree Line,” 2017. Each image depicts the same fir trees reflected in a lake, but the artist’s collage interventions create disturbing filters over the pristine scenes. Elsewhere, Fractions, 2017, presents wooden doorstops arranged in a starburst pattern. And in “End in Sight,” 2017, a series of seven black-and-white photographic collages melding portraiture and landscape, the human figure is always partially truncated, even while the horizon line appears preserved across the fragmented images.